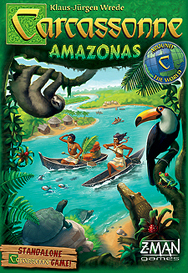 Carcassonne Amazonas is a new standalone game in the Carcassonne universe. Explore the Amazon to discover the many animals that live there. Visit villages and walk along the many tributaries of the Amazon River. And this time, victory will require more than clever tile and meeple placements: you'll need to stay ahead of the competition on the river itself.